Concentrated effort . . . I love this pink onesie. It is just the right shade, and the little ruffles are the perfect amount of sweetness without being fussy or cutesy. I know this is much ado about a little onesie, but I really like this one. Unfortunately, however, it has the magical power of inducing a blow out. This was true for Ella, who only got to wear it once or twice for more than half an hour or so, and incredibly, the same phenomenon seems to be occuring with Nora when she wears it. This picture was taken about 9 am. You can't quite see in the photo, but there is a little wet spot at her waist. Darn it! Into the laundry pile it went again. At least we got some cute shots in it today. 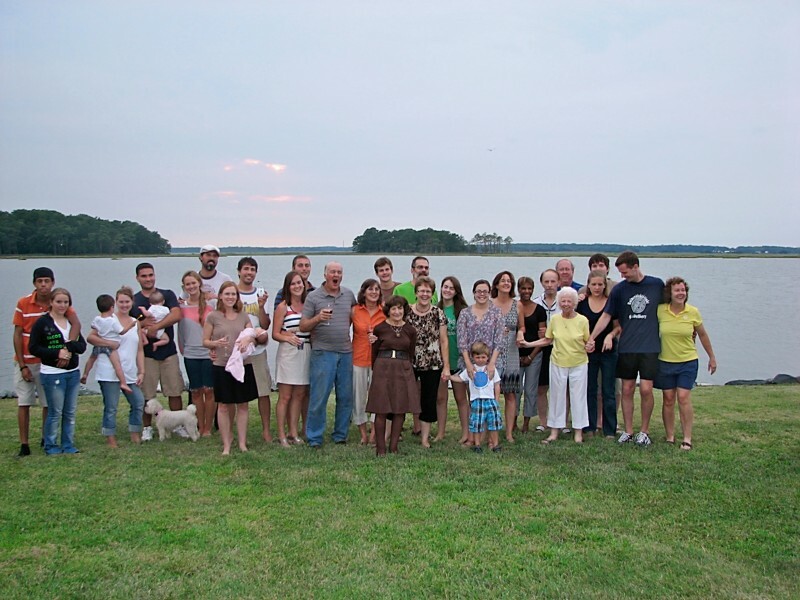 This past weekend the McCalls had the great delight of joining a whooole bunch of Malones at a beautiful house on a gorgeous piece of the Chesapeake. This house belongs to my Aunt Debbie who just bought it and envisions us all having lots of fun family times up there. We got a great start on that last weekend, and I think we have caught the vision too! It did start with what will probably become a legendary night of sleep deprivation, where Ella-belle treated a house full of maybe 15? 20? people to 2 solid hours of screaming from 11pm-1am. We did EVERYTHING we could think of to get her to settle down, but she was not having it. A drive around town finally did the trick, but we have never had to resort to that before. And guess what else? Nora slept peacefully in her little basket beside the pack n play the whole time. She must have been the only one in the whole house to do that. And this is not a smile, but it's still cute. What with Ella's perpetual busyness, climbing ability, complicated babbling and conversation, and expression of her will, I had forgotten how much of a sleepy little stranger a newborn is at first. But in the past week or so, Nora has started to be more and more interested in the world around her. She is staying more alert and has even smiled a few times. (I can't wait to catch one in a photo!) I've looked back at some old photos of Ella (so old! . . . about 15 months ago : P) and she has that same wide-eyed and somewhat bewildered look on her face. A little baby has so much to take in! No wonder life is so exhausting and distressing for them at first. But it is fun to see Nora starting to get into being in the world a little bit. Well, you can always tell when I've had company because the blog gets a little neglected. Paul's parents were here last week and we spent as much time as we could just being together. Ella really enjoyed playing with her grandparents and I think Nora was very happy to have more warm laps to sit on. We were able to show them the new house and take them on a little tour of downtown, including Paul's office. We also enjoyed lots of delicious home cooking from Paul's mom. Oh and while they were here, we scrambled and got out of the house for, count 'em, three showings. On Monday, I had the nicest little treat when my parents-in-law took Ella and Nora to the mall playplace while I got to spend my birthday gift certificate to Anthropologie from them. Great in-laws, huh? We had a great visit. Thanks for coming Vovo and Granddaddy!